From before the Great Depression, manufacturers were trying to find a way to bring less expensive modular homes to the middle class. Despite the efforts of several businessmen, the idea didn’t become a popular again until the end of WWII, when GIs came home to a vast housing shortage due to the rough economics of the preceding decade. The government predicted a need for millions of homes for the returning GIs and their families. A couple of men came forward with plans for well built, low maintenance homes for a post-war era filled with hopes for a better future. One, Buckminster Fuller, had originally invented a prototype in 1930. However, not until 1945 did his creation seem like it could become a reality. Then he sought to use the slowed-down aircraft production lines with hopes to inexpensively produce an aluminum house of the future, based on his geodesic dome construction, and called it the Dymaxion House. The bathroom was constructed of four stamped pieces of metal and meant to be extremely easy to clean, including a steam shower. However, people didn’t care for the cookie cutter design of the house or being limited to two bedrooms. Producing aluminum on such a scale was too energy intensive a process, also. Building the Dymaxion never took off. Only one prototype exists in the museum at The Henry Ford. 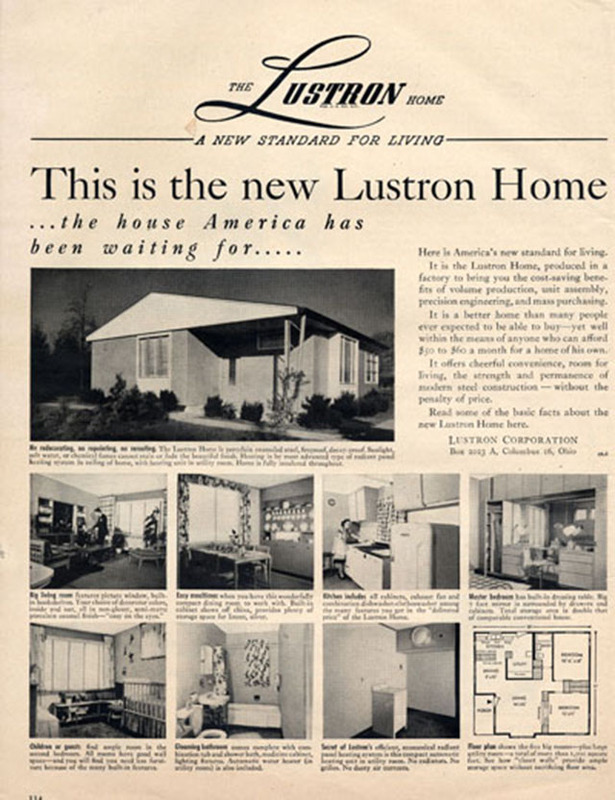 The Lustron Home was developed by Carl Strandlund specifically to answer the shortage of homes for soldiers returning from WWII. They were constructed of prefabricated steel, enamel-coated panels. The homes boasted built in wall units in the living rooms and bedrooms, as well as a combination washing machine/dish washer by Thor in the kitchens. 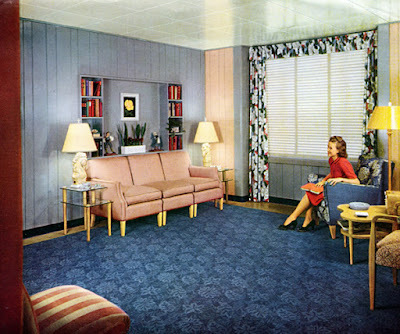 The homes came in two and three bedroom models and several colors. 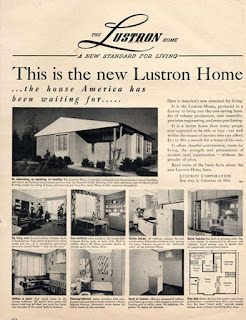 Lustron homes were advertised as “The House America’s Been Waiting For”. They boasted a maintenance-free exterior from roof to foundation. Waterproof, weather proof, rodent proof, and easy for Mom to hose down the outside and wipe on the inside. They included built-ins such as a china hutch, and pass through from kitchen to dining room, and a vanity in the master bedroom. The interior was available in two neutral shades of tan or gray. There were four exterior colors to choose from for the exterior: “Surf Blue”, “Dove Gray”, “Maize Yellow”, and “Desert Tan” as recorded by the Ohio Historical Preservation Office. Picture showing easy maintenance from a Lustron Ad. More than 2000 were built between 1948 and 1950 before the bankruptcy of the Lustron Corporation put an eventual end to their production. For many families, the Lustrons weren't only a pre-fab houses, but were most likely much loved dream homes. Close to 1800 still stand in 30 states, some well preserved and updated. Learn more about Lustrons and the people who love living in them today at: The Finely Crafted Blog and a video from The Ohio Historical Society. Kathleen Rouser, who doesn't live in the Dymaxion House or a Lustron home, has loved making up stories since she was a little girl. Her debut novella, The Pocket Watch, is part of Brave New Century, a Christian historical romance anthology, published in 2013. Her short story, “Special Assignment” was included in the 2014 bestselling anthology, Christmas Treasures. Her first full-length novel, Rumors and Promises, will be published in April, 2016 by Lighthouse Publishing of the Carolinas. 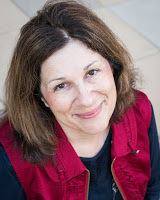 She has had several magazine articles published and also contributes regularly to Novel PASTimes, a blog devoted to promoting mainly Christian historical fiction. She is a long time member in good standing of ACFW and a former board member of its Great Lakes Chapter. Interesting post, Kathleen. Seems like those metal houses would be too hot in the summer and too cold in the winter. about the tiny house movement as well. Wondering what container houses are? 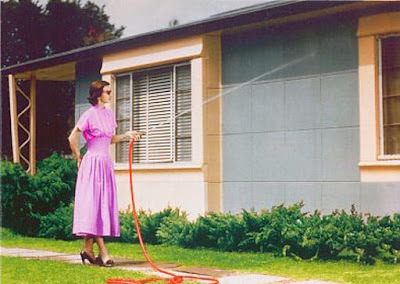 Got to love those ads: hosing down your house wearing heels and fancy dress. lots to preserve. Thank you for sharing that, Sharon.